Takeaway: After more than 10 years of research and development, the man behind Desert Greens H2O’s flagship, broad-scale hydroponic greenhouse, which is the first of its kind in Nevada, believes his systems have the capacity to redefine the current global food paradigm. Here’s Tom Blount with more info his A-Frame systems that are capable of producing four times the yields of average greenhouses. 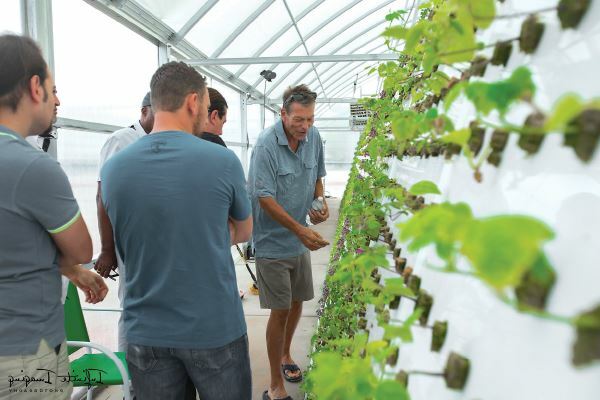 In May 2016, Blount’s flagship hydroponic greenhouse, located in Nevada, became fully operational. It was a proud moment for him, as he spent more than 10 years perfecting the system—a hydroponic grow system with a unique height and pitch design that exponentially reduces the carbon footprint of any traditional soil-grow or existing hydroponic application. Before discovering hydroponics, Blount owned a small restaurant on Kauai. Many years later, Desert Greens H2O was born. Desert Greens H2O’s vertical grow units produce four to six times the crop yield of current standard hydroponic greenhouses. “Our grow units allow for the utilization of the entire length, width and height of the greenhouse, which exponentially increases both crop size and harvestable plant material,” explains Tom. Compared to traditional farming, the increased yield is staggering, Tom adds, citing that, according to North Carolina State University, one acre of land is required to produce 26,000 heads of small lettuce per full harvest in soil. Its unique set-up isn’t the only thing boosting Desert Greens H2o’s position in the growing market—the company is also able to grow year-round. “Traditional grows are limited by seasonal conditions, which allow for a maximum of two to three harvests per year, whereas we have the ability to grow year-round with 12 harvests per year,” explains Blount. Another advantage they have going for them is water conservation. “Desert Greens H2o utilizes a closed-loop system which expresses more than 90 per cent in water savings over traditional soil grows,” Blount says. All that being said, Desert Greens is in more than just the leafy greens business. They are set to both license or sell their systems to other companies. For anyone considering maximizing their yields with A frames within greenhouses, Desert Greens H2O are your guys, no matter your current structure. “We can retrofit any existing greenhouse structure. We offer three different management packages and offer live-time monitoring of the greenhouse, combined with daily greenhouse climate and water conditions,” shares Blount. In addition, Desert Greens has also developed a proprietary nutrient blend, created with pharmaceutical-grade ingredients, to help growers get off to the right start. Starting without a structure? Desert Greens can also help with that. “We have a strategic alliance with Atlas Greenhouse, whom we recommend for the product quality, strength of structure and ability to customize their greenhouse sizes,” says Blount. So what’s coming up next for this innovative company? Desert Greens H2O is collaborating with the University of Nevada in an effort to obtain white papers confirming water savings, carbon footprint, square foot crop production numbers and increased nutrient values. Blount says his primary goal is to have every plant in his systems reach 100 per cent of their DNA capacity, with minimal impact on the environment. 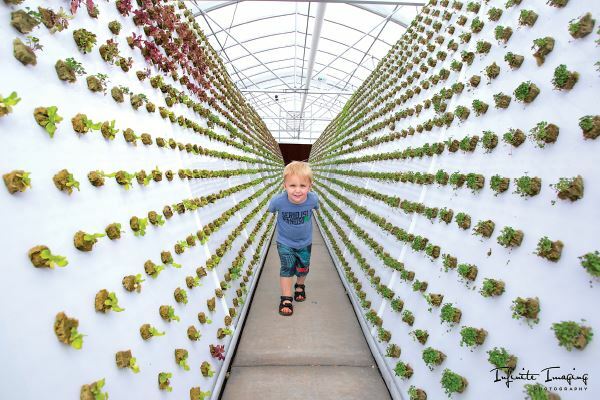 The Oxygen-Infused A-Frame System is a combination hydroponic and aeroponic unit, 60 feet in length and standing seven feet erect. The unit houses 4,050 sites. The system’s unique height and pitch design, coupled with a next-generation oxygen infusion system, allows for an exponential increase in useable, crop square footage. The Over Head Vining System is a unique overhead grow system designed to utilize the uppermost vertical space of a greenhouse. Vining plants thrive, and harvest techniques become more efficient. This system is custom designed for each specific application, and compliments the OIAF system, leading to increased productivity and other multi-crop benefits. The Large Plant System is a combination hydroponic and aeroponic unit. It is 64 feet long and stands two feet high with a flat grow surface. The unit can be two, three or four feet wide, and shorter lengths are available. The LP system houses large plants, such as tomatoes, cucumbers and peppers. Our plant placement design, which houses canopy plants throughout the greenhouse, utilizes traditionally unused space that current hydroponic greenhouses are not employing. The canopy plants create shade for crops that enjoy less light, and they also influence temperature variances. Our grow setting provides the optimal parameters for maximum yield in a multi-crop greenhouse. Images courtesy of Infinite Imaging.